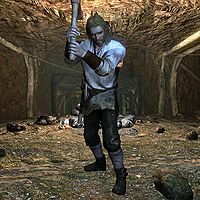 Gjak is a Nord miner who lives in Dawnstar and works at Iron-Breaker Mine. He mines the iron ore for Beitild all day long. Like his colleague, Bodil, Gjak never surfaces from the mine and spends his entire life working, relaxing, or eating. He wears a set of miner's clothes and a pair of boots. He is equipped with a pickaxe, and carries a selection of lower-class loot and gold. Gjak will greet you by telling you about how long he has been mining: "Been working in Iron-Breaker since I was a boy." He seems to be fairly content with his life though, as he will tell you, "Iron's a good, stout metal. A fine thing for a Nord to dig." This page was last modified on 16 October 2013, at 04:35.